I warm to Trevor Fox as the self-centred, ‘suffering’ writer, while Josie Lawrence’s long-suffering Madeleine makes an impact from the off. The pair fire barbs at each other and sometimes expose their suffering. Absurd though the situation may be, the emotions expressed – and the black humour – come across as authentic. There are hints of a dark world outside their window, adding to the claustrophobia. Director Roxana Silbert cranks up the pace, adding to the comic delivery. Ti Green’s set shows a kind of ordered clutter – the ever-growing body is as hilarious as the sprouting mushrooms are sinister. Dyfan Jones’s sound design complements the weirder moments and Chahine Yavroyan’s lighting washes the action in dramatic hues. Funny, to be sure, intriguing – in places – the production reminds us how much British comedy owes to European influences. Ionesco was Romanian but his work shows the sparks that lit the flame for the likes of Monty Python, Reeves and Mortimer, and The League of Gentlemen. Nikolai Gogol’s comedy, a satire of Czarist Russia, is brought to exuberant life in this sparkling adaptation by David Harrower. Director Roxana Silbert has gathered the most inclusive company I’ve ever seen: disabled and non-disabled actors, sign language users and interpreters, all appear side-by-side in this fast-moving, frenetic and farcical story of misunderstanding and mistaken identity. Everyone is in costume and a character in their own right, rather than segregating interpreters in a spotlight at the side of the stage. In fact, the expressive nature of signing lends itself very well to the heightened, exaggerated style of comic performance needed to keep Gogol’s balloons in the air. Much of the show’s comic energy comes from one man. David Carlyle is the manic Mayor of the little town expecting a visit from a government official. Carlyle must be knackered by the interval – he’s certainly exhausting to watch and very, very funny. His wife and daughter (Kiruna Stamell and Francesca Mills respectively) match him in terms of larger-than-life characterisations. Stamell’s pretentious use of French words and phrases is a delight, as is Mills’s immature frustration. Stephen Collins and Rachel Denning form a funny, Little and Large double act as Bobchinsky and Dobchinsky careering around the stage with a flair for physical comedy. Sophie Stone amuses as the less-than-honest Postmaster and I particularly like Michael Keane’s starving servant Osip, whose master, the conniving opportunist Khlestakov is marvellously portrayed by Robin Morrissey. Gogol lets us in on the joke from the off, allowing us to see Khlestakov’s cogs turning. Jean St Clair’s Judge Lyapkin-Tyapkin is elegantly expressive and none-the-less funny – In fact, the entire company is unflagging in its efforts to maintain the show’s fast pace. The laughs keep coming. Ti Green’s skeletal set serves as all locations. Much fun is made with the revolving door and I love the running joke of the lift with its muzak and prerecorded voice. Chahine Yavroyan’s lighting adds to the humour, with some sharp changes to highlight the characters’ frantic asides. Years ago I saw a production of this play that fell completely flat. I am pleased to say this smart and snappy show has exorcised the ghost of that failure. The playing is broad but detailed – Silbert overlooks nothing in order to wring as many laughs as possible from the situation, the script and her hard-working, talented cast. The play exposes human foibles in all ranks of society. Man is essentially corruptible, Gogol points out, putting us all in the same box. Surely it can’t be relevant to us today. Can it? I rather believe it is. The REP’s resident artistic director Roxana Silbert delivers a knockout production of John Steinbeck’s classic tragedy of lowly men. She has assembled a strong ensemble of players and draws from them powerful performances in a somewhat lyrical, naturalistic way in a stylised setting. This mixture of emotional truth and having the mechanics of the theatre in view all along works tremendously well, thanks to Liz Ascroft’s design and Simon Bond’s lighting but mainly, of course, due to the stellar company of actors. Michael Legge is long-suffering, neurotic George, travelling across Depression-riddled America with companion Lennie, who is more of a hindrance than a help. As Lennie spoils things for George every step of the way and George displays his deep-rooted annoyance, you wonder why he stays with the big galoot. But as we meet other characters and their loneliness is painfully laid bare, we realise it is loneliness that binds George to liability Lennie. Even the nearest town is called Soledad (loneliness in Spanish). Norman Bowman is striking as macho but warm-hearted Slim, while Ciaran O’Brien makes hothead Curley volatile and dangerous, a victim of small-man syndrome if ever there was one. James Hayes is heartbreaking as old timer Candy, evoking strong emotions as he carries a bit of old sack, fashioned to represent his elderly dog, and Dave Fishley brings both dignity and anguish to crippled Crooks. Lorna Nickson-Brown is trouble on legs as Curley’s otherwise unnamed wife (apart from ‘tart’) – They all come across as very real, although they are cogs that Steinbeck winds ever tighter so the tragic climax becomes inexorable and inevitable. The American Dream is unattainable, he says, but it’s what keeps people going in times of extreme hardship. One wonders what the British equivalent is, during this period of austerity. Vera Lynn, perhaps, promising blue birds over Dover’s white cliffs…? The central relationship between George and Lennie is the keystone of the entire piece. Silbert brings their contrasting aspects into sharp focus. Michael Legge is superb as crotchety George, but Benjamin Dilloway’s Lennie is an outstanding piece of character work. His Lennie amuses, touches and frightens us, all within a range of seconds, and back again. He is a not-so gentle giant who should not be allowed in a petting zoo. Even if you know the story, this production cranks up the tension, making the brief flashes of humour and the briefer glimpses of hope of a better life all the more poignant. Intense, gripping and devastating, this Of Mice And Men resonates with humanity unloved and the tragedy of unrealisable dreams. 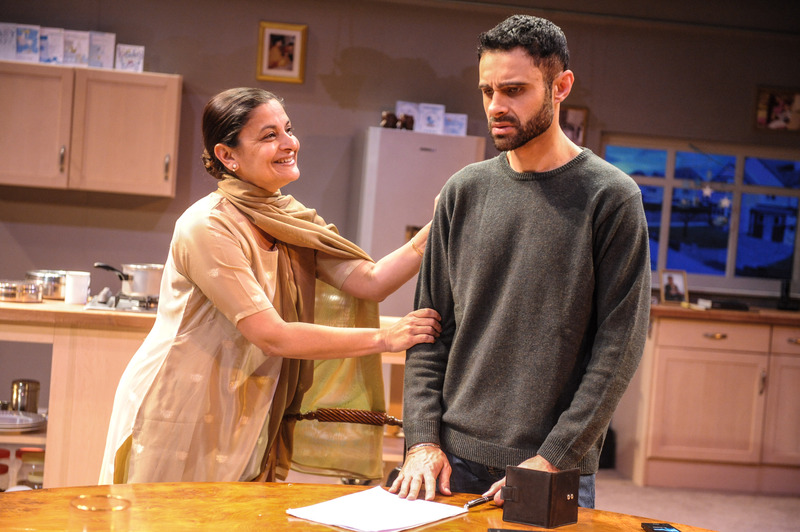 Gurpreet Kaur Bhatti’s new play is set in the home of an Indian family in Birmingham. At the heart and head of the family, formidable matriarch Jeeto (Sudha Bhuchar) clings to a dream of going ‘home’ to a vista of green fields, viewed from the ancestral verandah. To this end she pushes son Pal (Rez Kempton) to keep the family shop established by her late husband open on Christmas Day, but Pal has other ideas. He wants to sell the shop and set up his own business, a care home for elderly Asians in a refurbished pub. Pal’s wife Liz (Lauren Crace) has been assimilated into the family and is more than happy to adopt the traditional role of the daughter-in-law as live-in domestic help, while Pal’s spirited sister Cookie (Zita Sattar) regrets having married and raised children, as she was expected to. When cousin Reema arrives from India with her own views of independence and fending for herself, the family tensions that have been simmering like the ever-present pan of ‘chai’ boil over. It’s an involving play, keeping on the right side of soap opera and melodrama, acted and presented naturalistically. Director Roxana Silbert handles the events that put strain on family ties by keeping things simple and straightforward, allowing the characters to spark off each other. The script is very much a conventional one and does not need gimmicks or flashy transitions to dress it up. Jamie Varton’s set has the audience as three of the walls of the house, giving an intimate setting complete with running tap water and a working gas hob, grounding the play in the realness of its subject matter. The cast is excellent with Bhuchar and Sattar standing out as mother and daughter with contrasting temperaments. Kempton and Crace also do well in their scenes of marital strife with the latter especially touching as the white girl who left her own family behind for love. Neil D’Souza is good fun as Cookie’s hapless husband, Major, ostensibly a bit of a prat until Pal’s plans go awry, and Preeya Kaludas impresses with her portrayal of Reema’s decline from idealism to destitution. There are some very funny lines, many of which come from salon owner Cookie who is not opening on New Year’s Day because ‘ you can’t do a Brazilian with a hangover.’ There is also a lot of heart and no shortage of tension in this story of family dynamics and the clash between ambition and tradition. You may not understand the odd word or line of Punjabi with which the dialogue is peppered, but you don’t need to. The universal truths of human relationships speak loud and clear. Dramatically, Khandan is old-fashioned and sturdy but above all it’s an engaging and satisfying evening’s entertainment.